Gangnam style !! Unless you are living in a deserted island far beyond the reach of media sources, you must have heard about “Gangnam Style”. This is a pop music video by Korean rapper and choreographer PSY. It has already crossed 300 million YouTube views and reached no. 1 spot on itunes. PSY also featured on 2012 MTV Video Music Award, Saturday Night Live and The Ellen Show. So, what makes it tick ? How did it manage to reach the position, coveted by many social media and online marketing campaigns ? This is the ultimate outcome of humor and eargasmic music with the touch of viral inbound marketing. Viral marketing in the context of online world is mass distribution of content (text, music, video, picture) to large number of targets, with the intent of encouraging them to share with their contacts. This content sharing process leads to massive traffic growth, without much effort from the marketing firm. One important factor is that, the content here should promote a product/service or at least convey a marketing message.Any YouTube video of a cute puppy that has huge amount of views can’t be a result viral marketing, as it didn’t promote any business. The unconventional look (chubby Korean singer with slicked-back-hair in a tacky suit),funny dance steps, catchy beats, unorthodox places to dance and of course the Korean hotties are the elements of the video accounting for 269000 facebook likes & 786000 twitter shares. This is the very essence of inbound marketing. The end product is so lovable that, it gets found by the customers and what follows is highly targeted enormous traffic. Inbound marketing is so attractive because the marketer doesn’t get skimmed through the spam filter or clutter.This is crucial, as people have control over the information they receive. You can make use of free web marketing tools like blogging, social media, press release, social bookmarking,article submission to get started.This is one more prime factor, as it significantly reduces the cost in comparison to traditional media (TV, Print). 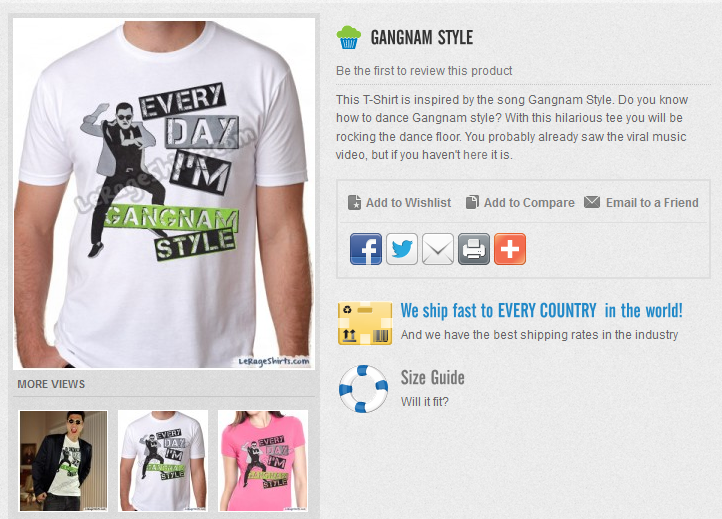 “Gangnam Style” may not look like outcome of the efforts of a marketing firm. But, that’s the primary objective behind it.Check out the highlighted links present in the description of the video, which are ready to be converted into sales with a single click. There is no absolutely no denying to the fact that “content is king”. The focus should be on producing an entertaining advertisement.Something, that will be liked and shared by the audience. It is obviously difficult to get the number of views like this music video for an advertisement. Still, we can consider ‘The Force’ campaign by Volkswagen can excellent example of commercial that wen viral producing 54 million views on YouTube. None will be sharing or liking the content, if they don’t find it. 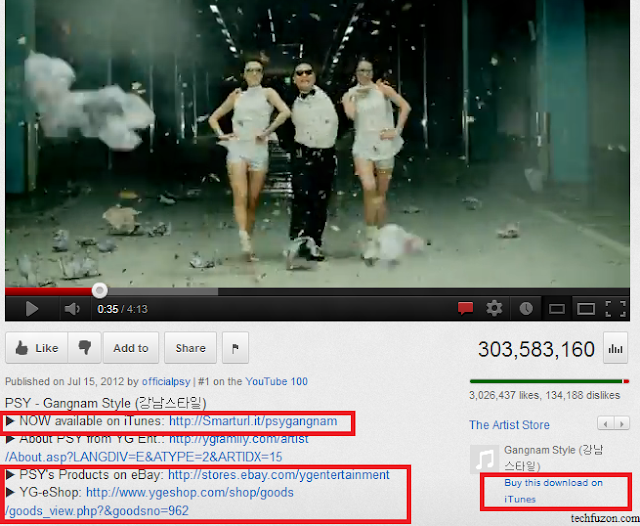 “Gangnam style” video was shared on twitter, liked and shared on facebook, Youtube and whatnot. So, when it comes to campaign distribution a marketer should not leave any stone unturned to share the content. If the content deserves it, none will hesitate or retweet or share the same.US President’s Barack Obama’s winning was partly because of leveraging power of social and inbound marketing.He successfully tapped Facebook and YouTube to connect with youth. PSY went to USA, for the promotion once the video became viral. He promoted himself on The Ellen Show, The Today Show, SNL, all of L.A’s hit music stations and even made an appearance at the MTV Music awards.When it comes to online advertising, evrything changes with a blink. So, a marketer needs to strike when the product is hot.The picture given below depicts “Gangnam Style” t-shirt on sale. Celebs have huge fan following and their tweets can instantly put you in lime light.In this case, Britney Spears and Katy Perry loved the video and shared with their followers.Check out the video of Britney learning the dance steps of “Gangnam Style”. This is the parody by web marketing solution provider Hubspot, with focus on inbound style. Next story Which movie to watch?